As we kick off a new year here at WVJC-Bridgeport we sat down with one of our December 2016 Licensed Practical Nurse graduates, Vannessa Crim. Vannessa toured many colleges after her high school, hoping to find one that fit her college expectations. Vannessa was looking for a small community college that would know her by her name where she was not just a number. Her first step toward making the decision was meeting with the High School Admissions Representative Adam Pratt. He clearly explained the process and the dynamics of the school. The next step for Vannessa was meeting with the LPN Director; Lisa McDonald, whom made her feel comfortable. Vannessa quickly figured out she was in the right hands once she saw Lisa’s personality and the compassion that she had as the LPN Director. After meeting Lisa, she knew she was not only choosing the right college but the right field. WVJC was going to allow her to combine her love of science and compassion for others in the path to becoming a nurse. Vannessa enrolled into the program and started her journey. This included a lot of long nights and headaches, but she always had the desire to learn just a little more. Time passed quickly as she progressed through the program. 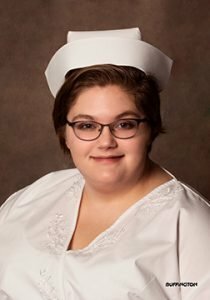 Her favorite part of the LPN program at WVJC was the large amount of hands-on experience during clinicals’ (after all she is a hands on learner). Vannessa quickly connected with her instructor, Pam Wilson because her dedication to the nursing field and the WVJC students. Her confidence quickly heightened as she continued to get words of encouragement from Mrs. Wilson and other WVJC staff members. Vannessa’s favorite words of advice from Pam were, “Get better, better than you were yesterday.” Her class of choice was Med-Surge. This class drew close to her heart because it covered material from the beginning of life to the care of a dying patient. The idea of Vannessa’s perfect day is beginning her day working in a Wound Care Clinic with the sick and showing compassion towards the ones in need. Then ending her day with dinner and movie with her supportive sister. In five years she would like to be a more independent person, successfully working in her desired career and working toward her BSN. Looking back on the previous year Vannessa was not only excited about her new upcoming adventures but thankful she chose WVJC because she knew it was a place she could always call home.